If you’re like me, your house is full of books. My end tables are stacked with them, and my apartment is home to quite a few well-stocked shelves of books. But even with our own personal libraries, we can still take time to add some unique flair to our bookshelves. Here are a few pointers that I’ve learned in my quest to mix style and function. 1.) Think horizontal as well as vertical. In addition to the standard vertical bookcase, you can also find room dividers or horizontals, such as the one pictured above. These are especially great if you have collections of other objects, like framed photos or vases, that you’d like to display. 2.) 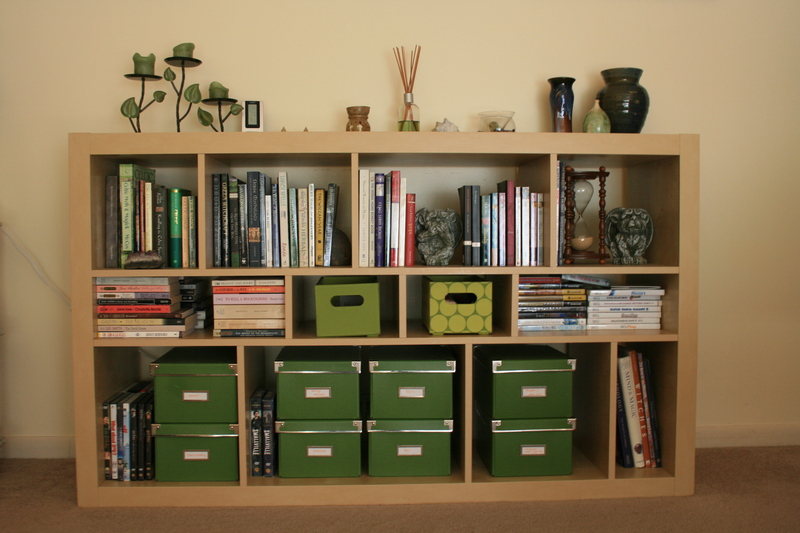 More than books: media storage. The bookcase above is also used to house my collection of DVDs and videogames (in the green boxes). If you’re a fan of magazines or journals, you can also buy special boxes for your magazine collection. Photo boxes (preferably acid free), available at craft stores like Michael’s, can hold photos of family, friends, or travels. And baskets and bins serve as storage for anything from loose change to sunglasses. 3.) Add meaningful objects. A few examples from my life include the gargoyle bookends pictured above (hand-me-downs from my brother), as well as a miniature bust of Mozart from Venice (a gift), a faerie statue (also a gift), and a decorative mask purchased at the Ren Faire a few years back. I like to choose objects that inspire me or have personal significance. Even if you just have a small amount of extra space, adding a framed photo or small souvenir gives a personal touch. 4.) Stack your books. Divide up rows of books with stacks. 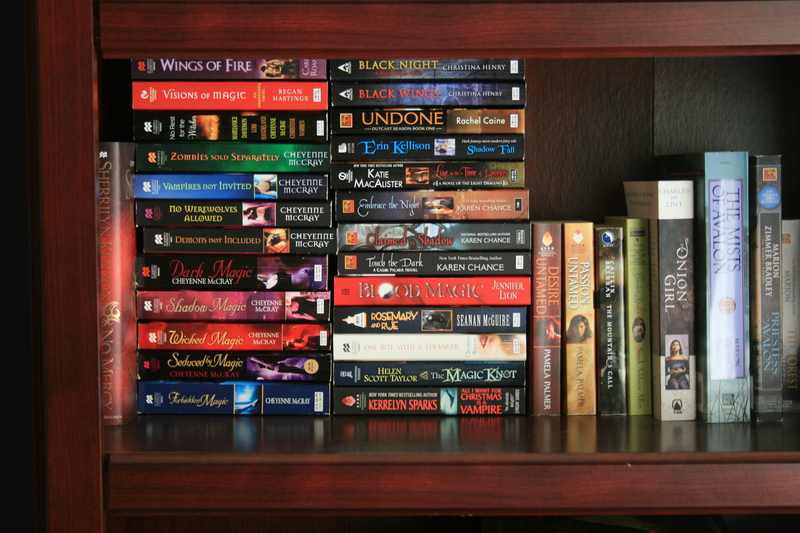 Especially with paperbacks, you’ll get more storage space this way, and stacking adds visual interest. What about you? Do your bookcases house anything besides books? How do you dress up a bookcase? That’s a nice post, Denise. You always have some interesting posts about the personal life of an author. where can I purchase a bookcase like this? I love it and how you decorated it!